Gregg Hurwitz is known for thrillers that reliably put new twists and spins into tried and true themes, making him someone who crafts a tight suspenseful story. TRUST NO ONE is his latest, and arguably his best. The protagonist in this new book is Nick Horrigan, a somewhat unlikely but solidly believable protagonist who has been living a relatively quiet and solitary existence in Santa Monica, California. But all that changes one night (in a fast-paced opening chapter that races you into the story) when he is awakened from a sound sleep to discover that his apartment is under siege by a SWAT team that takes him into custody and speeds him toward a nuclear reactor facility. It seems a terrorist has taken the facility hostage and will only speak with Nick. The man Nick finds when he arrives is using the high-profile siege to get some cryptic information to him. Known to Nick only as “Charlie,” the erstwhile terrorist is actually a former associate of Frank Durant, Nick’s stepfather. Durant was a highly regarded Secret Service agent who was mysteriously murdered 17 years earlier. The circumstances of Durant’s death are such that Nick still feels responsible, no less because of the mysterious strangers who sent him on the run for some nine years through the far reaches of the Pacific Northwest, from Alaska to Oregon. Charlie is taken off the grid all too soon, but what information he is able to share with Nick gradually begins to turn his world upside down. Nick soon finds himself pulled in different directions between two political camps: one that wants to know what information he has and the other that does not want the information revealed. What is ironic, however, is that he doesn’t have what everyone thinks he has. Outnumbered, outclassed and outreached at every turn, Nick has only a few clues to work with and even fewer resources. What he gradually discovers, by virtue of some dogged digging and an ex-girlfriend’s computer and networking skills, is that everything he thought he knew about his stepfather’s death, and his own culpability in it, could be wrong. As Nick moves closer to the truth, he finds that he has to make a choice that will affect not only his own future, but arguably that of the nation as well, as a long-buried secret comes back to haunt a statesman on the eve of his greatest triumph, with the capacity to turn it into his greatest tragedy. 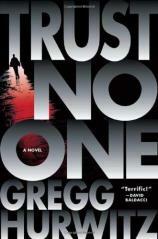 Hurwitz takes major chances in TRUST NO ONE, including one that is particularly impressive and surprising. Even if you see the ending coming, there is a twist or two by book’s end that is entirely unpredictable. For his part, Hurwitz plays fair all the way, relying less on misdirection than upon careful plotting and skilled writing to create a work that is at the top of this year’s must-read list. A side note for readers here. Hurwitz recently has been writing for Marvel Comics, crafting new stories for the icons Wolverine and The Punisher, which is generating new interest in the characters. Fortunately, for those of us who wait with impatient eagerness for his books, Hurwitz has been working with equal diligence on his novels.